We have been updating our deck these past few months to get it ready for the outdoor season. We love spending time outside and enjoying the weather, and sitting on our deck is our favorite. We started by cleaning and staining the deck, making a few side tables and now hanging outdoor lights. We did not want to just string the lights to a few clamps and hope that they would stay up in a storm or windy day. We started by purchasing this multi-purpose wire, a few clamp sets, and eye bolt screws . 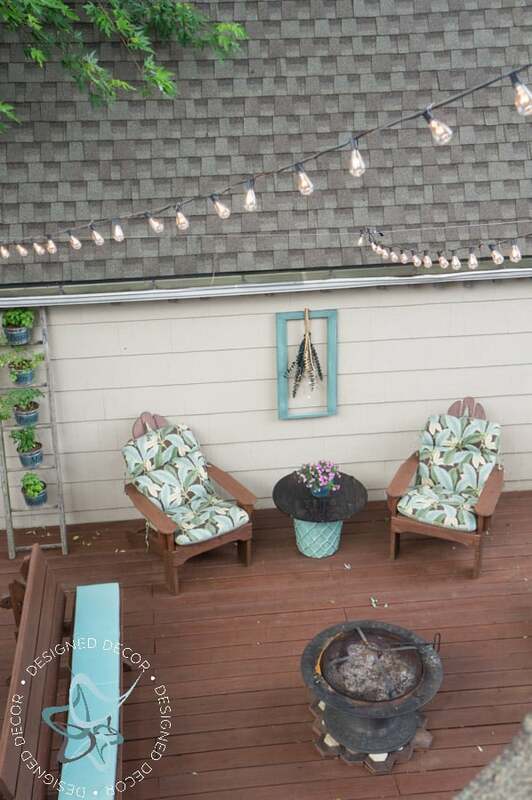 I wanted 3 separate sets of string lights to be above our lower deck area. So we decided to string the wire from the peak of the house and run it towards the garage. It’s pretty far up there! Mr. DD measured and cut the wire for 4 different strings using wire cutters. Mr DD. screwed the eye bolt screws into the side of the garage near the roof line, at the height we wanted the lights to be. He added the clamp sets to each eye bolt and attached the wires to the clamp sets. He also did the same thing of the peak of the roof line while he was up there measuring the wire. He attached all the wires loosely just to have them all in place. Once they were all in place, he started at the peak of the roof where all 3 wires came together and tighten them first. He moved to the other clamps and pulled the wires tight from the peak and tightened each wire. Now, they are all set for the string lights. Mr. DD ran another wire across the garage roof to attach the middle light stand to the wire. He did not want to screw the eye bolt into the roof. Since our deck sits pretty high, we could not just screw the eye bolt under the eave, taller people would hit the lights. I purchased my string lights from World Market. They come in a 10 string and a 30 string version. I used “3” 30-light strands. We never had much lighting outside and this was the perfect addition we needed. We removed our hot tube this year and I love the additional space we picked up with it being gone. You can read all about how we cleaned and stained our deck this year. This was by far the easiest method we have tried. It saved us so much time and frustration! Also, did I mention a giveaway for the same tools I used? Stop over after you finish reading this post. We moved the bar to where to hot tub sat and it is right outside the kitchen window so we can pass things out the window to the bar area. I made the vertical herb garden using a ladder I pulled out of the trash and a few galvanized buckets. I also made 2 sides tables using a ceramic planter and an electric spool. You can also see in the above picture my water fountain, I love the soothing sound of running water. We want to make a few more additions like changing out the fire pit to a propane burning one that way we can turn it on and off as needed, adding a wireless waterproof speaker system and figuring out a perfect placement for a flatscreen. Now all the work is done, it is time to sit back and enjoy a few beverages outside on our deck. Who wants to join me? Now, you can go over and register to win! « The Easiest Way to Stain a Deck!